Isis came back for refurbishment in June 2015. He'd been working hard, the surface was worn off with much stroking in places ( ears, top of neck ) and the hair was mostly gone. There were some cracks in the gesso and chips from the odd knock. He jumped the queue for restoration as he's so important and was ready to return home for Christmas - but the Christmas tree has to go in his place ( under the watchful eye of the reception desk) so he is going back on March 3rd, 2016 . He has been stripped down to the wood again, cracks repaired, given new gesso, paint and hair. The saddle has a new seat and saddle cloth and he has new reins and browband. No stirrups this time - they do too much damage to the horse and it was thought children might get caught in them. I've changed the colour scheme - a bit more dramatic than last time. And there are extra layers of varnish on the neck and ears - see if it lasts longer. But he might get even more stroking with his new white mane. I have had to trim the mane shorter than shown here as it was thought to be impractically long. It still looks glamorous. And his name - Isis is the name of the Thames river as it flows through Oxford. In 2008, that was all it meant to anyone. We may have to change it.... not that he has his name on the stand or anywhere and the children who ride him don't know his name. They probably all have their own names for him. He has been restored and repaired many times in the past and is now due for another complete restoration. He is very large - (51"- [set low on stand] x 69", body 33") and very heavy. With his extra carving, tongue and huge eyes he would have been a top of the range model. He was probably made between 1880 and 1900. The top picture shows him as he was in January 2008. Not much hair left, his ears have been replaced not exactly correctly in the past, the sides of the horse and the stand are well worn by much use. Also the original saddle back has been removed some time ago and there are numerous cracks along the joints. There have been some modifications to the stand and fixings presumably with the intention of giving the horse extra strength for the heavy workload he has. I'm not sure yet if I will leave them or change them. The second picture shows the horse with the old surface partially removed. There are remnants of his original light blue / grey base coat under the top paint and some very faint traces of dapples. The original paint and gesso were too damaged to preserve so the surface has all been removed and will be replaced by new gesso and paint. 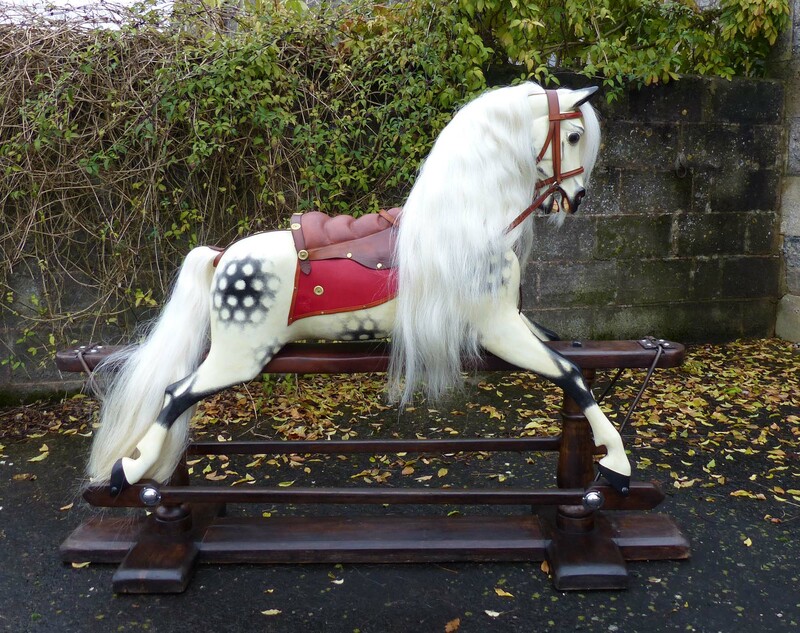 The third photo shows the horse completely stripped back to the wood. The cracks, holes and knocks are being filled and repaired and the one loose leg is being reglued. The fourth picture shows the new ears. The right ear had been replaced from the base a long time ago but it wasn't the correct shape so a new one has been made. The left ear had been rasped down to match the bad right ear so this one needed a new tip. He now has two good ears again and a new saddle back. The next stage was to give the horse a new gesso surface. Gesso does protect the wood but its main purpose is to cover up all the tiny carving marks and fill all the rough wood grain so that the horse has a very smooth surface suitable for painting on. This traditional material is a primative plaster made from chalk and glue and is painted on - 9 coats here. It will now be left to dry out thoroughly for 4 - 6 weeks. There will be cracks appearing as it dries out and these will need filling before painting. Then it will all be hand sanded to make the surface really smooth - a slow and dusty job but essential if the horse is to look as it should. Scroll right down for a picture of the newly gessoed horse.